Being one of the oldest living places in India, West Bengal is dotted with several ancient places. Nabadwip is one amongst these ancient places which have been in existence since the 11th century. The presence of its age-old temples and monuments certainly proves its age. Nabadwip is famous amongst local tourists for its temples and learning centre where one can learn about the different aspects of life and the philosophy of humanity. Hence, these temples can also be called philosophy schools. So, how about planning a trip from Kolkata to Nabadwip, the land of philosophy schools? As the temperature in and around the region remains moderate throughout the year, Nabadwip can be visited anytime in a year. However, if you desire to enjoy its natural surroundings along with savouring the beauty of its temples, then the best time is from August until the end of March. By Air: Kolkata airport is the nearest airport from Nabadwip and is located at a distance of around 125 km. By Rail: There are direct trains available between Nabadwip and Kolkata. You can catch a train from Kolkata railway station to Nabadwip Junction. It will take you an approximate time of 5 hours to reach your destination. By Road: With an average distance of around 130 km from Kolkata, Nabadwip can be accessed easily by road. However, route 1 is the fastest as it will take around 30 minutes lesser in comparison to route 2. On your way to Nabadwip, you can take a break at Singur and visit its beautiful temples. Singur is located at a distance of around 45 km from Kolkata and 91 km from Nabadwip. It is the perfect destination en route to Nabadwip if you are looking for some peaceful atmosphere to take a break. It is located in the Hooghly district of West Bengal. You won't find many places to enjoy in Singur, however, you can visit its beautiful temples and explore its green surroundings. Eventually, after taking a delightful break at Singur, you will be within the walls of Nabadwip. Nabadwip is located at a distance of around 91 km from Singur. Being home to some of the oldest and beautiful temples in West Bengal, Nabadwip is a definite place to detox yourself and purify your mind, body and soul in its divine environment. It is located in the Nadia district of West Bengal on the banks of Bhagirathi river and is believed to be formed in the 11th century during the reign of the Sena dynasty, when it was one of the major centres of philosophy and learning in West Bengal. Being the birthplace to the social reformer and a significant saint of Bhakti Movement, Chaitanya Mahaprabhu, Nabadwip has become an important pilgrimage site in Hinduism and hence, the land of Nabadwip is dotted with numerous temples. Following are the major places to visit when in Nabadwip. Radha Rani Temple is one of the most visited temples in Nabadwip and there are several legends behind its formation. The temple is dedicated to Goddess Radha and was built to honour the love Radha has for Lord Krishna. However, it is also believed that the temple was not built by anyone and emerged on its own. 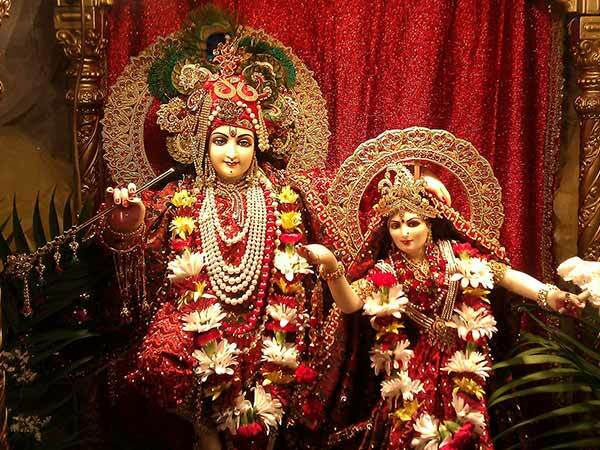 Several devotees from all over the state gather here every full moon night to celebrate their everlasting love because as per tales, it said that when Radha went missing, Lord Krishna found her on a full moon night. Isn't it interesting? So, why not visit this beautiful temple and listen to the tales of love and romance? Undoubtedly, the most beautiful temple in Nabadwip when it comes to modern architecture, ISKCON Temple is dedicated to Lord Krishna and is a major religious site for Vaishnavites. The lush green surroundings with a small lake in its compound certainly enhance the existing beauty of the temple. You must visit this monumental work of architecture in Nabadwip. There are also several bookshops and a guest house for the devotees coming here to worship their lord. Located at a distance of just 8 km from Nabadwip, Purbasthali Bird Sanctuary is a wonderful place to enjoy the nature surrounding the temples of Nabadwip. Due to its popularity amongst bird lovers, it is visited by hundreds of tourists every week. If you want a short break away from the temples into serenity, then Purbasthali Bird Sanctuary is the place you should be. You can also spot several migratory birds during the winter season. This beautiful sanctuary has also become a weekend destination for photographers. Sri Chaitanya Saraswat Math is another important religious site in Nabadwip. The temple is dedicated to Lord Chaitanya, who is believed to be an incarnation of Lord Vishnu. Lord Chaitanya was born in Nabadwip; hence, this temple is considered a major pilgrimage site where numerous devotees come to pay their respects to the lord. The temple started its journey with a small hut; however, over a period of time, it has taken a monumental shape. Today, it is visited by thousands of tourists on a regular basis.